BP Drains have more than 14 years experience unblocking drains in Canterbury and utilize leading edge technology in the fight to rid your drains of troublesome blockages. Regardless of where your problems originate or their severity we root them out and clear them away quickly and effectively. From private flats to the largest industrial concerns, no problem is too large or too small for our highly trained technicians. What’s the point of hiring someone to clear your blocked drains if the problem simply reappears a short time later? If that happens it means that whoever did the initial work either didn’t understand the nature of the problem or cut corners in order to collect the money and get out. You will never encounter that type of incompetence or unprofessional approach when you enlist BP Drains to fix your drainage problems. Honesty - If you can’t count on the price we quote you or the work we do we won’t be around long as a company. We understand to our core that dealing fairly and openly with our customers is the key to their satisfaction and our success. We leave the games to the amateurs and focus on delivering quality and value for you. Integrity - When our technicians enter your home you can be assured they will behave with the utmost professionalism at all times. That means displaying a clean, professional appearance, respecting you and your property, maintaining a friendly, open demeanour and being available to answer any and all questions. Hard Work - It seems some guys spend more time on break than they do on the job. That’s not us. 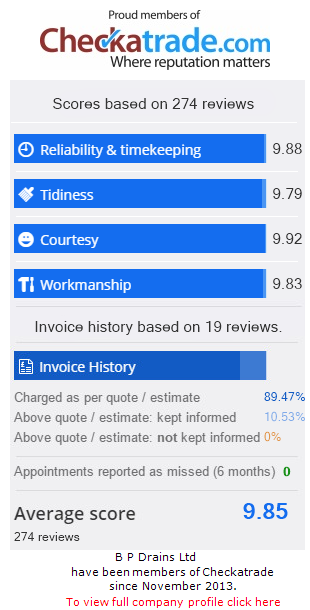 We arrive on time ready to get to work and apply all of our efforts to restoring your home or business to 100% functionality as quickly as possible. Fair Prices - Our system of fixed rates ensures there will be no unpleasant surprises on your final bill; no charges for work that was never done or materials that were never used. Once we ascertain the nature of your problem, we provide you an accurate quotation based on our system and that is that. If what you seek is a long-term solution to your drainage problem large or small, call the undisputed leaders in drain unblocking in Canterbury and the surrounding area. Call BP Drains. We’ve worked hard to earn the trust and satisfaction of our clients and work just as hard today to keep it. There’s no blockage problem too big, no drainage system too complex for our technicians to handle. Call us now on 01843 293 040 for a free no obligation quotation or to arrange for one of our drainage specialists to visit and assess your situation in Canterbury. You can also contact us through our website and while you’re there, see what our customers are saying about us. Don’t waste your money on temporary solutions. Call BP Drains today and experience the difference a professional drain unblocking service can make. Buying a Home in Canterbury?